AT&T will sell you the future at just $66 a month – the Samsung Galaxy Fold is now available for pre-order in the US. This is with a 30-month AT&T Next contract, but you could also pay the full $1,980 up front – it’s up to you. If you pre-order now, your unit will be delivered by April 25. You can choose between Space Silver and Cosmos Black, both cost the same (the Martian Green and Astro Blue colors are MIA). There are no storage options to choose from, the phone comes with 512GB and that’s it. If that sounds good, here’s the pre-order page. From previous information released by Samsung, it’s clear that T-Mobile will also offer the Galaxy Fold, so you may want to hold off on pre-ordering – the competing carrier might offer a better deal. Best Buy and Samsung Experience Stores should have units too, if you just want to walk in and pick one up. Verizon hasn’t officially confirmed whether it will offer the Fold or not (but leaks say “yes”). 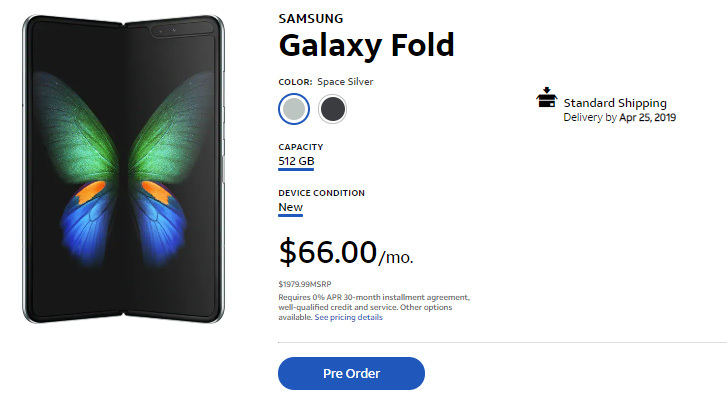 The Galaxy Fold was briefly available for pre-order from Samsung.com, but the supply ran out pretty quickly (no word on how many units were available, though).